Having moved out of content production for Outwitters (no more new teams/map themes, but we’re still looking out for balance and bugs), I thought it’d be nice to at least show off some of the leftover race concepts. They’d have been redrawn for the actual game, but I’m still pretty fond of a lot of these designs. Maybe you’ll see some of them crop up in a future game. I’m especially proud of the ice pig. Aww.. These would have been cool! I think the problem in the game is the über pack, I mean OML “waste” the time in creating new races and we just get for free. Wow, very nice, and very sad that we won’t see more in game… I guess it is still not making enough money. Such a shame that it does not work for such a brillant game. no further additions sounds very sad. the game has the potential for being a true classic. if all gates are closed this would be very odd. Aww man… All these teams are super cool! I wish that’d you pay a revisit to Outwitters after TtL 2 racks up some bank. Wow, this is the reason i want to do graphic design. I’m curious… What did the specials do? Well, I’m saddened by this because I’ve put almost $15 dollars into Outwitters. (The most I’ve ever or will ever put into an iOS game ever again) I don’t think I’ll be able to dish out that much money again for a sequel or the like. (Most of the time the original trumps the sequel anyways.) While I do enjoy your games, I don’t think I will be buying any future games produced by you when I can play the already excellent originals. Sorry. On the one hand, these concepts look awesome so I’m a little sad. On the other hand, I’m relieved that there won’t be additional teams in ranked play. Balance is already enough of a nightmare as it is. I still would have liked to see these teams in friendlies though. Ah well, maybe there will be an Outwitters 2 some time down the line. UDS! God I want the undead race really badly. Would probably pay 10 bucks for em. OMG. Keith Burgun plays this game! o.o I’m a fan of 100Rogues btw. Very sad to see no new content. I’m a fan of hours Keith! So sad, but expected… I can live without new teams, especially if the current ones are tuned a bit more so I am compelled to use more than the adorables. But new maps would be sweet… Understand that it would be too much work, but would be cool if you released tools so the community can create maps and vote them into league play somehow. Something for Outwitters 2 perhaps? Man. Your imagination really knows no bounds. I’m not sure wether to laugh or cry, for obvious reasons. But even if Outwitters is gone, OML lives on. And I can live with that. Yes, we can dream! And until they pull the plug on the servers we can also continue to enjoy this gem of a game. Alex and Adam, hopefully you will still do the little things like the weekly top 200 and replay highlights etc, so the game isn’t abandoned completely. On a completely different note: Alex and Adam, have you pitched outwitters to any of the boardgame companies out there? Outwitters is a perfect match for a boardgame! Could perhaps be an alternative revenue stream? Its keith, yay. Niw we have the two best of IOS right here. These concept r really cool. I still see a lot of the Same creatures (3 veggienauts in one 2 vs 2 map for example) and I think more creatures wound really add something to the game. I CANT WAIT UNTIL TTL2!!!!!!! The Outwitters board game. I have to admit that sounds down right awesome. Also saddened to see production stopped. Wish I had an answer for it but I don’t. Here’s hoping for an Outwitters 2. I think what went wrong was the app was free. Had you had to pay $.99 or $1.99 for the game I would have totally been willing to do it. It’s a great game with great potential! I think what turns some ppl off is that the game was freer then with expensive in app purchases. I love the game and I think you should at least put out two more teams just to make the people who bought the über pack worth it and just to add more depth 🙂 I can’t say I like these designs in particular though. But inlovebyour games but please keep up the good work! And hopefully had some more stuff to outfitters. I hate to see you have stopped production on outwitters I think it’s an amazing game! I think you should deffinatly add at least the first two I’d love to see new teams! I wouldn’t not mine paying for them either I have already purchased the uber pac, increase game limit to 35, and the 2nd gen maps. I’m soooooooooooooooooooooooooooooooooooooooooooooooooooooooooooooooooooooooooooooooo sad that I can’t think. So sad that they won’t be in the game. It’s a shame that the game never took off as well as it should have. At least we have TtL2 to look forward too! I’m really saddened by all of this. I downloaded Outwitters the day that it was released, and I have since bought everything that you could possibly buy for the game minus two base skins. To be honest, and this will come off harsh but I don’t mean it to, I almost feel slighted. I know that we got three extra teams technically, but the feedback and adorable armies were there from the get-go. So it feels like we only got, to me at least, one extra team throughout all of this. The veggienauts. I feel as though I kind of got gypped of more teams, especially having bought the über pack. But here’s to hoping that all of these teams that you just displayed here make it into Outwitters 2! I really hope as well that you have an option in Outwitters 2 to buy all the races from the old original Outwitters. That’d be great to be able to play with the old classics and the new ones, having potentially up to seven or eight teams. That would be amazing! As well, I wanted to make a guess at the specials. I have no idea for wa-kapooie, but I think that the coffin for the woken has the ability to raise teammates from the dead. Maybe when the woken die their ghost stays on the map for one more turn, and if the coffin can make it to them they can resurrect them and bring them back onto the battlefield with only one HP, or something along those lines. 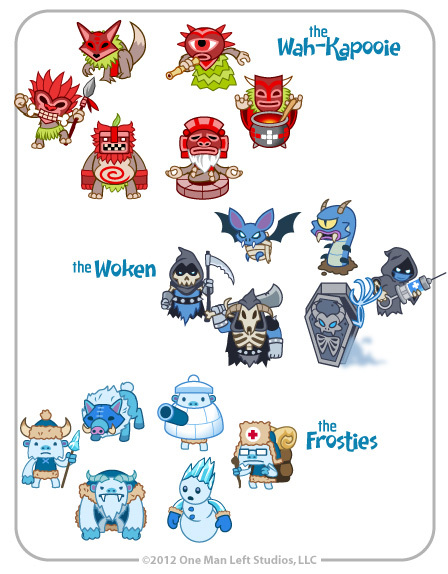 As for the frosties, maybe the snowman could’ve frozen enemies in place? Freeze an enemy to the exact location that they’re in so that they cannot move and cannot attack until a medic comes and heals them. God, now that I’m thinking about it even more I’m even more upset that we’re never going to get these teams on this game. They look so fun! TAKE MY MONEY FOR NEW CONTENT! 1.) Change the uber pack to a “3-team pack” (Feedback, Adorables, Veggies). 2.) Add a new “3-team pack” for the same price as the original uber pack with these three new teams! Even if they only work in friendlies for now! 3.) Or better yet, charge for each team individually with a “3-pack” discount – choose 3 teams, get a discount. Could you please add them? I flat out dont like the second team and for the wakapookie the special unit and the medic I dont like either but thats just me though, but for the Frosties I think the medic should be like a Saint Bernard with its barrel having the medic sign! That would be just soooooo cute :3 I’d totally buy them 😀 Please add some more teams! You could hold a contest for designs and only those have or will purchase from the shop can enter and have their designs for a team made. That might get more publicity and an incentive to buy something from the store. WOW, they all look great! I would be a very happy fellow if the game updated and I saw these in the store. Ohwell. 🙁 Game is fine as it is but it could be AMAZING if they wanted it to be.. This is such a sad news. I suggest running a kickstarter campaign to raise money for additional teams. You can secure some initial capital and gauge public interest. Then you can release the new team and probably configure a code system to allow backers unlock the team and allow other players to purchase them as IAP. What can I say… Outwitters is my favorite IOS game of all time. Bett than fruit ninja, jetpack joyride, Infinity blade. I’ve been playing this game ever since it came out and it has been such a great time! At the time all I had was an iPod touch and could only play when I was connected to wifi. But this game was so great I ended up making the jump to the iPhone 4S (among other reasons) but I say that to tell you guys that this game really was my all time favorite. I’ve spent this year struggling and battling all the way from the fluffy league, and now I made to master right before the end of the second season! Working my way up has been awesome and really fun. The way every game was unique and the strategy was easy to understand yet infinitely complicated. Whenever a friend had an iPhone I always told them to get this game! Not only is it my favorite IOS title but it has become one of my all time favorite games (I’m 22 and have been playing games all my life) I say all that to say this. I understand how business can muck up an excellent thing. However I really hope that this is actually just a hiatus where you guys get your feet back on the ground. I’ve been a fan of OML since tilt to live was released and I am looking forward to tilt to live 2! I really hope it will bring in revenue for you guys and gives you a boost to persue more projects. I think it’s extremely impressive that it is just the two of you at the studio. Games of this high of quality are few and far between and it’s obvious that you guys make games because you enjoy. You guys remind me of Team Meat (Super Meat Boy) and I hope that guys push through the hard times and keep making great games. This is an extremely long comment but I just want to say that I sincerely hope that this is just a hiatus from hiatus and you guys come back ( maybe this summer for the annniversary?) better than ever! I would highly recommend expanding outwitters to other cellular devices, maybe a kick starter, and more Internet exposure. This game is truly a masterpiece, the world just needs to realize that!!! The Frosties sniper has one extra eye. what are the special abilities of the special units for these classes? You have to release the teams.For the good of your fans. Even if the U ber pack doesnt include them. just please do it. I beg both of you. Kickstarter? I’d chip in a Hamilton to see this happen. THESE PACKS ARE SO COOL! Why month you release them for outwitters? Many people would like them and I would buy them individually I I had to. Hello Sean, they said they won’t release any more team packs. I AM SO SAD. I FEEL LIKE A PERSON IN A DARK ROOM WITH A SPOTLIGHT ON ME AND I KNEEL DOWN ON A SHINY FLOOR GOING “WHYYYYYYY??! !” AS WELL AS SHAKING MY FISTS TO THE CEILING. Oh, what about being able to basically customize your own team pack with the team packs you buy? I really want to use the Scallywags runner, Feedback soldier and sniper, Adorables medic and Mobi, as well as a Veggienauts heavy in my team. I understand game design and the issues with implementation on a finished game, but I would love to see these races put in game. I’d pay again. Maybe release a premium version, or an OW2. There is a huge lack of quality strategy games that can be played in hot seat let alone online. @Tyarthas: We can only really develop for one game at a time, and at the moment that’s Tilt to Live 2. Both of us are interested in returning to turn-based strategy at some point though, with a smarter business model next time. Please add! The fans will pay top dollar for these 3 teams!